The Cleveland Cascade is not a dance move common in the state of Ohio. Rather, it is an outdoor Oakland stairway disguised as a park, or vice versa, that was created to provide a small taste of Italy right in the center of Oakland at the edge of Lake Merritt. 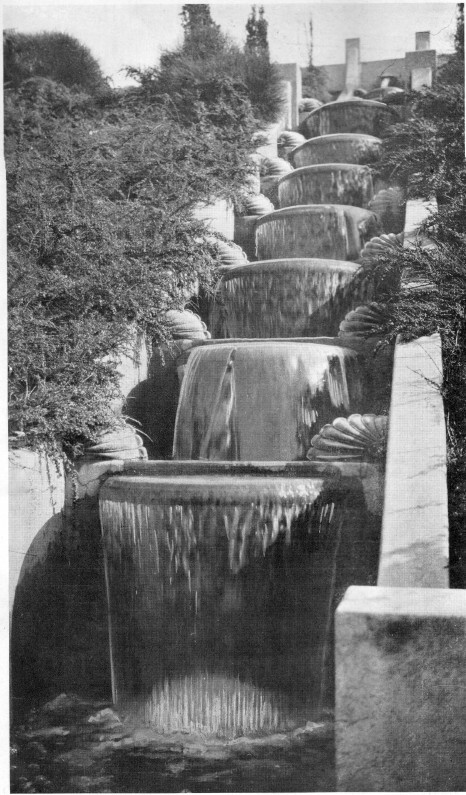 It was originally made possible by East Bay landscape architect and overall garden activist Howard Gilkey in 1923, and featured 20 colorfully-lit ‘cascading bowls’ that created a 250 foot rainbow waterfall in the center of two stairways. Gilkey, who was named “Man of the Year” by the Business Men’s Garden Club of Oakland in 1964, intended the park to be a highly unique and beautiful public experience that connected the Cleveland Heights neighborhood to the lake, on a hill deemed too steep for cars. His vision went beyond a well landscaped stairway, and employed the use of new electric water pumps and colored light bulbs to create a sublime water-guided descent, or ascent, for the pedestrian. In 1923, the San Francisco Chronicle ran an article announcing the new park with the headline, “WATERFALL ON LAKE MARGIN NOVEL FEATURE”. The Cleveland Cascade’s days as a colorful waterfall spectacle ended in the 1950s when its upkeep went “downhill”. Now it mainly functions as a scenic stairmaster for the physically fit, as it provides five flights of outdoor stairs. It bustles in the morning with joggers, walkers, and boot camp groups doing push-ups all the way to the top. It’s lush with ferns, the concrete is worn, and the waterfalls are gone. The Cascade is now its own version of a hybrid Roman ruin and fitness park, but still fulfills its duty as a picturesque way to go up, down, and maybe back up again. Carrie Hott is an artist based in Oakland whose work begins with topical or historical research and takes the form of drawing, sculpture, and installation.